Around election time our friends throw a "bologna party". This was the first year that we were invited. We all brought a few of our favorite things and enjoyed each others company. The bologna sandwiches were amazing. Iris also made Chicken Matzo Soup! That was a real treat. I brought two salads: Broccoli Salad and a family favorite, Pea Salad. I also wanted to test this recipe with the gluten free flour conversion. 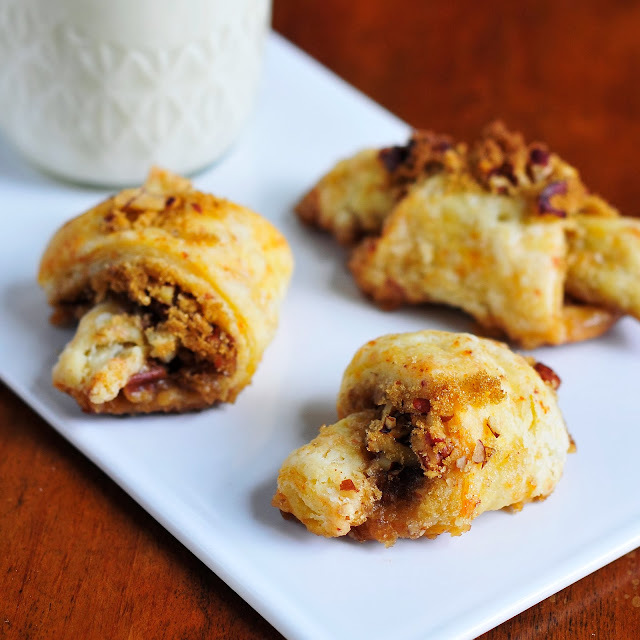 I brought a whole plate of these delicious Pecan Crescent Cookies or also known as Rugelach. When ever I bring something to a party and I am testing a recipe I am always very honest with my friends. In return, I need them to be very honest with me in their evaluation of the dish. I don't get offended. I expect all types of reviews. After all, we are all different and like different things. The only thing I notice to be a bit different in the dough are the layers. The batch made with all purpose flour definitely had a more flaky texture, but the gluten free version was not far off in texture. I also noticed that the gluten free dough was a bit different. You want the dough pliable-not too dry and not too wet. Do what you need to do to make sure this is the case by adding a drop or two more water if the dough is too crumbly or adding a bit more white rice flour if the dough is too wet. Like with most pastry like doughs, handle it gently and not too much. **Use the white rice flour to dust your surface and rolling pin. Use a generous amount--I did. The last thing I would suggest is to roll the cookies as tight as possible. Any of the dough (for both versions) that was not rolled tight had a tendency to unroll during baking. Take your time and you will have a successful batch of delicious cookies. I can tell you that even if they don't turn out perfect, they still taste really, really good. I had three piles on my plate--the first batch (not pretty), the second batch (getting better) and the the third (beautiful). It took me a few rounds to make the perfect rolled up crescent cookie. I hope that my few tips will help you make the first batch flawless. 1. In medium bowl add flour and butter. Use a pastry blender to blend until crumbly. Stir in cottage cheese. The dough will still be a bit crumbly but it will come together after resting in the refrigerator. Divide dough into thirds; wrap in plastic wrap. Refrigerate 2 hours. 2. Preheat oven to 350 degrees and line two cookie sheets with parchment paper. 3. Remove dough from plastic wrap and knead 4-5 times until dough is well combined. On well-floured surface, roll one part of the dough into 10-12 inch round. 4. Combine brown sugar and pecans in a small bowl, set aside. 5. Using a butter knife, spread one third of the butter used for the filling onto rolled out dough. 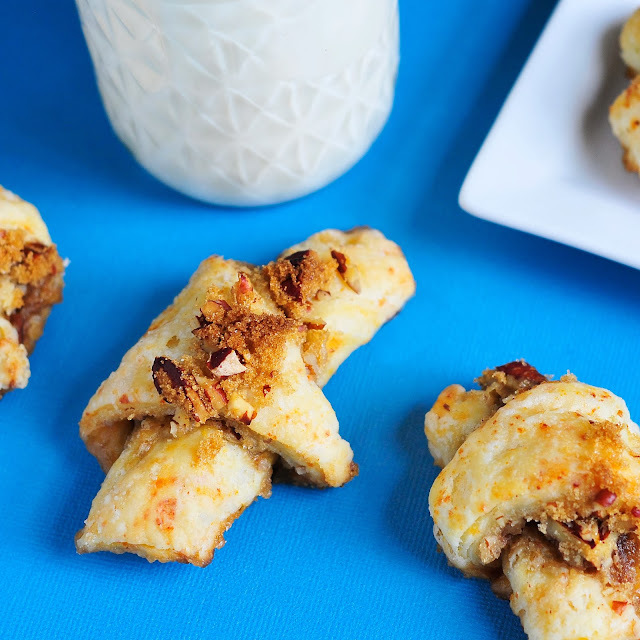 Sprinkle with one-third each of the brown sugar and pecans; lightly press into dough with hands. 6. Cut each round into quarters. Cut each quarter into 3 wedges. Roll up starting with long end; place, point side down on lined cookie sheets. 7. Bake 30 minutes or until lightly browned. 8. Remove immediately from cookie sheets to cooling racks. The brown sugar will melt onto the cookie sheet but there is still enough filling to make the cookie quite tasty.